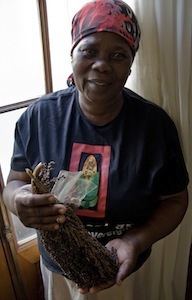 CAPE TOWN, South Africa, Apr 22 2012 (IPS) - In an almost ceremonial manner, Selinah Mncwango opens her big plastic bag and pulls out several smaller packets, each filled with different types of seeds: sorghum, bean, pumpkin, and maize. They are her pride, her wealth, the “pillar of my family,” says the farmer from a village in South Africa’s KwaZulu-Natal province. Sixty-five-year-old Mncwango comes from a family of smallholder farmers in the village of Ingwawuma in the east coast province. The crops she grows today are from seeds that have been handed down from generation to generation, over decades, she says. Other seeds come from exchanges with neighbouring farmers. “My seeds are very important to me. I hope the day will never come when I have to buy seeds from a shop,” says the farmer, whose five children and eight grandchildren largely depend on her harvest. She is keenly aware of the fact that seed saving, storing and exchanging promotes crop diversity, saves money and provides smallholder farmers with a safety net in case of harvest failures. But the traditional farming methods of smallholder farmers – which, researchers say, also help to fight soil depletion, reduce irrigation needs and adapt to climate change – may soon disappear. They are being wiped out by governments focused on promoting commercial monocultures that they hope will bring fast, high yields in order to boost national agricultural sales on global markets. “The sector is dominated by commercial seed companies and industrial agricultural production,” explains Rachel Wynberg, policy analyst at the Environmental Evaluation Unit of the University of Cape Town in South Africa. Small-scale farmers have been systematically pushed out of the system by those who put profits before food security and biodiversity, she says. “There is a poor understanding of small farmers’ rights. Traditional agricultural practices have thus been eroded over decades,” she adds. In South Africa, and in most other countries on the continent, the rights of small-scale farmers are regularly violated by governments and commercial entities that push genetically modified (GM) and hybrid seeds – which have been cross-pollinated in controlled environments – on them. This is common despite a 2006 United Nations International Treaty on Plant Genetic Resources for Food and Agriculture (IT- PGRFA) that protects farmers’ indigenous knowledge, demands rewards for their contribution to maintaining crop diversity, ensures their participation in decision-making about genetic resources, and guarantees their rights to save, use, exchange and sell seeds. South Africa and many other African U.N. member states never signed the treaty, however. According to Wynberg, government support of small-scale farmers is incoherent and insufficiently funded, lacks capacity and often ignores the needs of farmers. “Government is unfortunately often not delivering,” she adds. Smallholders agree. Mncwango, who has actively tried in cooperation with many rural farmers in her community to protect their traditional farming methods, says she is appalled at the South African government’s drive to sideline them. According to Mncwango, farmers often realise too late that GM seeds cannot be saved for the next season, and that they contaminate traditional seeds. Farmers have had to learn the hard way that hybrid seeds are of inferior quality. “They don’t store well and they rot easily and have less nutritional value,” she says. Researchers like Wynberg confirm the large disconnect between agricultural policies that are deemed “progressive” and farmers’ needs. “High yields are traded for long-term food security,” she says. Lawrence Mkhaliphi, agro-ecology manager at Biowatch, a non-governmental organisation promoting sustainable agriculture, has been working with small-scale farmers in KwaZulu-Natal province for many years. He takes the argument a step further. South Africa’s Department of Agriculture denies these accusations. The Department of Agriculture supports both traditional and commercial farming methods, Jaftha says. It ran a national programme to reintroduce traditional seeds in rural areas and has a Plant Genetic Resources Centre in South Africa’s capital Pretoria, to conserve traditional seeds.